A three hour event of kai & korero at Parihaka for participants in SCANZ (Solar Circuit Aotearoa New Zealand) Raranga Tangata 2009, a two-week digital media residency for artists and curators. Te Miringa Hohaia (Taranaki Tuturu / Taranaki Whaanui) and Local Time hosted a meeting with food at Parihaka. The meeting came together at the site of the Parihaka Peace Festival where the SCANZ group of international digital media artists could eat and spend time at the historically significant site of Parihaka with Te Miringa Hohaia, the founder of the Parihaka Peace Festival. 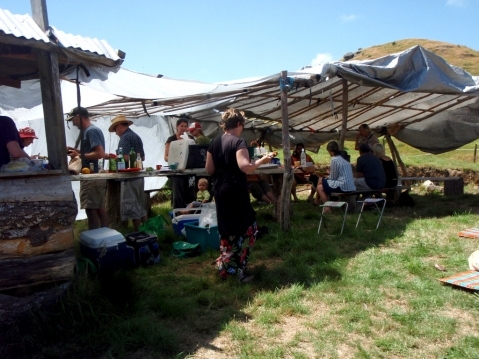 The picnic was an opportunity for international and local artists to mark Waitangi Day at a site that has been significant in New Zealand’s cultural and political history, and in our own practice.